Possibly one of the most well know Victorian medicines. It was a cocktail of opium alkaloids, including morphine and codeine, combined with alcohol. Although there was no single formulation for laudanum, it typically contained approximately 10% opium combined with up to 50% alcohol. It was extremely addictive. Due to its bitter taste, it was mixed with many things including spices, honey, ether or chloroform, wine, whiskey or brandy, and even mercury or hashish. Depending on the strength of the tincture and the severity of symptoms, a typical adult dose ranged from ten to thirty drops. It is difficult to understand today how such a dangerous and addictive drug could be used so routinely. It must be remembered, however, that in the Victorian Era there were very few treatment options for people who were ill. Added to that, it was a time of high levels of infectious diseases such as cholera and typhoid and conditions such as diarrhoea and dysentery were rife. Pain, from ailments such as headaches, toothaches and period pain, was also commonplace. As the addictive nature of the drug only became known in the latter part of the century, it is unsurprising that a medicine that promised to cure all ills became so popular. Pain relief: The primary medical benefit of opiates is their pain-relieving effects. They work by reducing the perception of pain, decreasing the reaction to pain and increasing pain tolerance. Respiratory depression (slows down the rate of breathing): Although a side effect of opiates, this can be useful medically to relieve the symptoms of chronic lung disease or even anxiety. If the dose is too high, however, breathing may stop completely. This is the most common cause of death in people who overdose on opiates. Suppression of cough reflex: One of the most common uses for laudanum was its use as a cough medicine. As if this wasn’t enough, it was often given in combination with chloroform. Drowsiness: The occurrence of tiredness or drowsiness, was another side effect of treatment. It meant that laudanum became popular as a sleeping aid. Euphoria: On top of relieving a variety of ills, the use of laudanum could induce a state of euphoria which gave users a craving for their next dose. Tolerance: The more a person takes opiates, the more the body develops a tolerance. This means that to maintain the same level of pain/symptom relief the dose needs to be increased over time. Mental impairment: A longer-term effect of laudanum is that patients appear to be in a daze, disconnected from daily life. They are often in a severe state of indifference, not knowing or caring what was going on around them. Increased sensitivity to pain: Although uncommon, this phenomenon did occur, particularly if the dose of the drug was escalated too quickly. 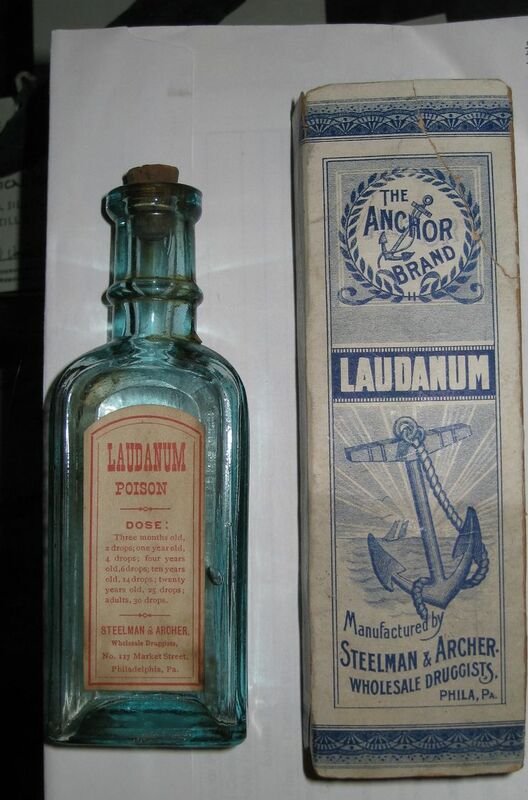 During the 19th century, laudanum was obtained freely without prescription. As the century progressed and the dangers became more understood, attitudes changed. In the 20th century products containing opium became clearly labelled. It wasn’t until 1914/15, however, that the manufacture and distribution of opiates became more controlled.